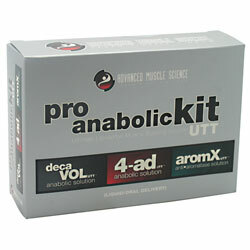 » Decavol UTT is a unique anabolic suspension pro–. » 4-AD UTT is a unique anabolic solution pro-hormone that converts at a high rate of testosterone. The liquid oral delivery system will give you better strength and size increases than the old testosterone precursors. » Arom-X UTT is a unique dual-function solution that is scientifically formulated to suppress estrogen production and restore natural testosterone output while acting as a strong libido enhancer. Ingredients: DecaVOL UTT: Purified Water, Propylene Glycol, Polysorbate 80, Glycerin, Caprylic/ Capric Triglycerides, Lecithin (Phosphatidylcholine, Phosphatidylethanolamine, Phosphatidylinolsitol, Phosphatidylserine, Phosphatidic Acid), Natural and Artificial Flavors, Phosphoric Acid, Xanthan Gum, Guar Gum, Sodium Alginate, Aspartame, Sucralose, Potassium Sorbate Sodium Benzoate, Foam Control Agent. 4–AD UTT: Purified Water, Propylene Glycol, Polysorbate 80, Glycerin, Caprylic/capric Triglycerides, Lecithin (Phosphatidylcholine, Phosphatidylethanolamine, Phosphatidylinositol, Phosphatidylserine, Phosphatidic Acid), Natural And Artificial Flavors, Phosphoric Acid, Xanthan Gum, Guar Gum, Sodium Alginate, Aspartame, Sucralose, Potassium Sorbate, Sodium Benzoate, Foam Control Agent. AromX UTT: Purified Water, Propylene Glycol, Polysorbate 80, Caprylic/capric Triglycerides, Lecithin (Phosphatidylcholine, Phosphatidylethanolamine, Phosphatidylinositol, Phosphatidylserine, Phosphatidic Acid), Natural And Artificial Flavors, Phosphoric Acid, Xanthan Gum, Guar Gum, Sodium Alginate, Sucralose, Aspartame, Potassium Sorbate, Sodium Chloride, Sodium Benzoate, Foam Control Agent. DecaVOL UTT: As a dietary supplement, take 2 oral doses per day ? under the tongue, hold for 30 seconds, then swallow. Use in divided doses 8 hours apart. Shake well before use. 4–AD UTT: As a dietary supplement, take 2 oral doses per day, hold for 30 seconds, then swallow. Use in divided doses 8 hours apart. AromX UTT: As a dietary supplement, take 2 oral doses at night with last meal, hold for 30 seconds, then swallow.